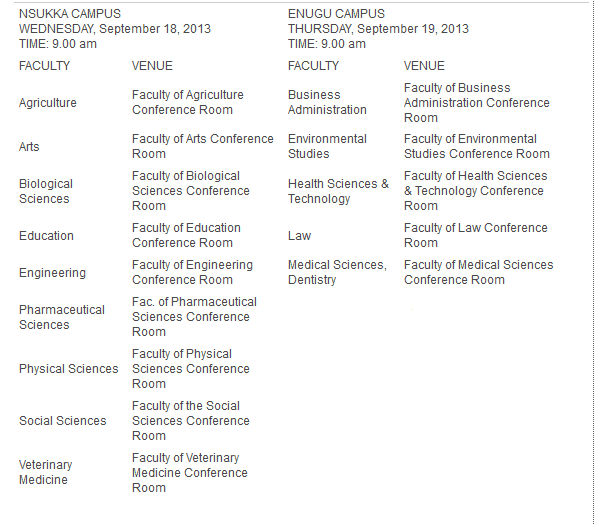 The registration for the 2013/2014 Direct Entry of the University of Nigeria has commenced, and its timetable is equally out. Candidates who registered with the Joint Admissions and Matriculation Board (JAMB), who applied for Direct Entry Admission into UNN and who have a Degree or at least a Merit/Lower credit level pass in Diploma or NCE, or RN/RM Certificate are invited for this Screening and Interview. The screening will be conducted at the Nsukka campus of the University on Saturday, September 14, 2013 at 8:30am. 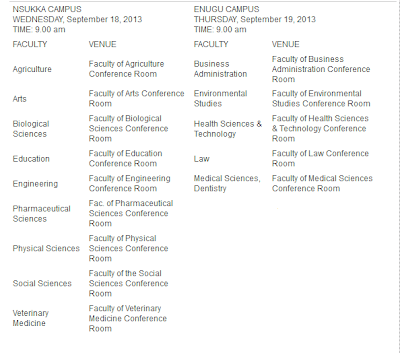 University of Nigeria Direct Entry Online Pre-registration commences on Wednesday, August 28, 2013 and ends on Monday, September 9, 2013. Those who fail to register within this period will not be screened. With the scratch card, candidates should access and complete the University of Nigeria 2013/2014 Direct Entry Screening form online at http://portal.unn.edu.ng. Candidates are expected to answer questions on subjects related to the courses they applied for in addition to English language. Information on the Venues for the screening will be made available on the University of Nigeria website, www.unn.edu.ng, before the screening date. Candidates can access the results of the screening exercise with the appropriate scratch cards at the University of Nigeria Portal, www.portal.unn.edu.ng, from Sunday September 15, 2013. Printout of the screening results.